The perinatal period (from conception to one year post birth) is a challenging time in most women’s lives. 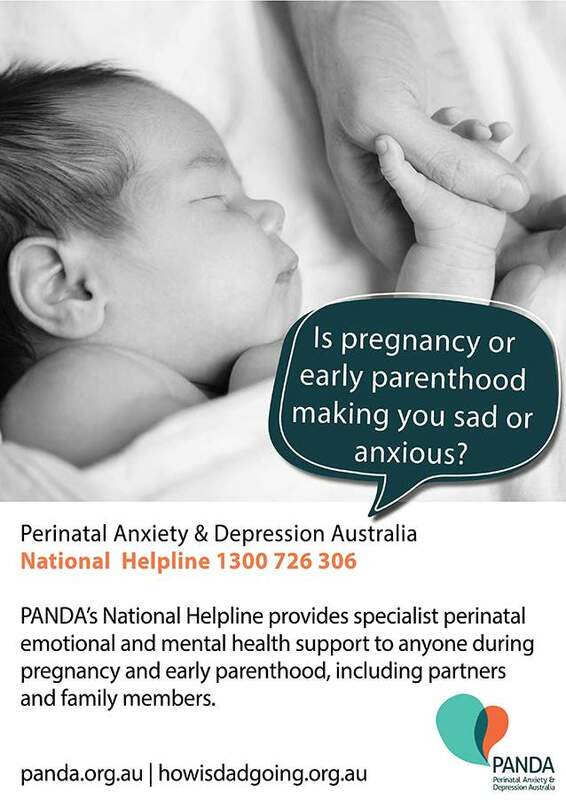 As many as one in five Australian mothers experience perinatal depression or anxiety according to figures from Perinatal Anxiety and Depression Australia (PANDA). 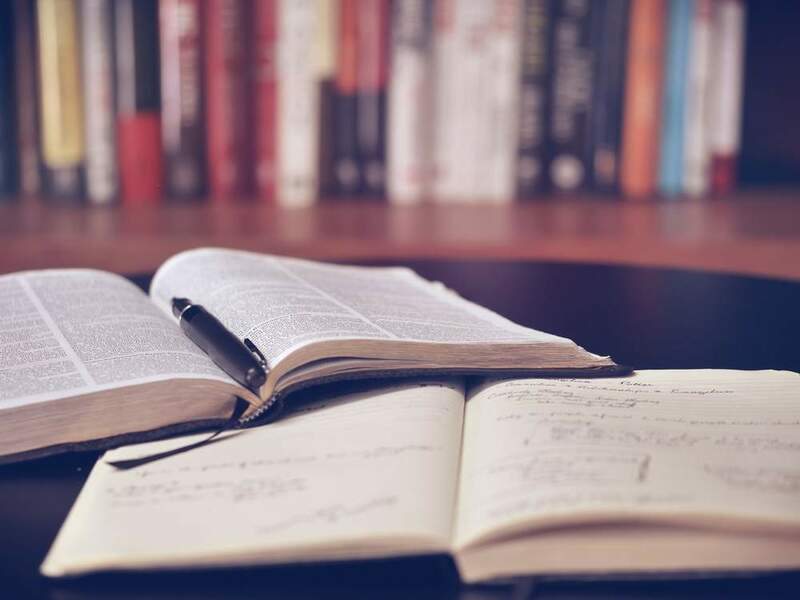 Even though it’s a common experience, the topic is rarely discussed openly – partly due to the stigma around mental health conditions and partly due to the fear of being seen as a failure or a bad parent. As a result many families struggle in isolation without seeking help. 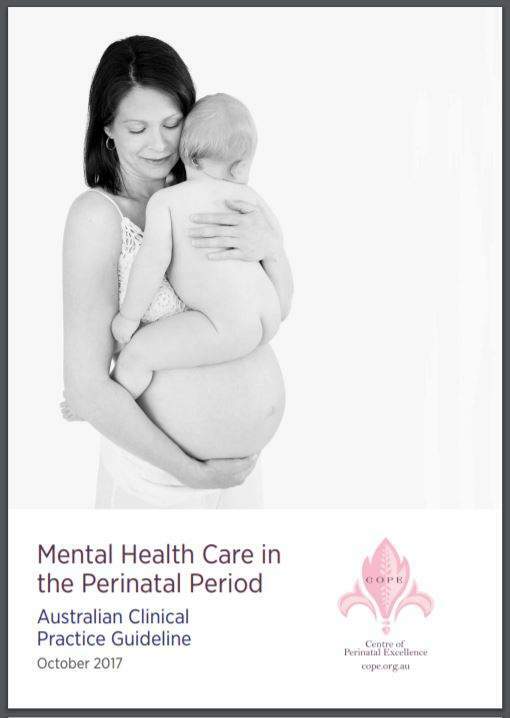 The impact of perinatal mental health conditions are serious and broad reaching. The experience of motherhood, as well as family relationships, and the health, wellbeing and safety of new mothers is negatively affected. Unfortunately, suicide remains a leading cause of maternal death in a number of developed countries, including Australia (AIHW, 2015). Most women are able to continue providing care for their infants but in serious cases a mother’s ability to function and their children’s developmental outcomes can be compromised. Perinatal Anxiety and Depression Australia estimated the direct and indirect costs associated with perinatal depression at more than $433M in 2012 alone (PANDA 2012). Support is critical to the wellbeing of Australian women and their families. Over the past 15 years the Australian Government has made significant investments in perinatal mental health. Most notably the $85M National Perinatal Depression Initiative which was funded from 2008-2015. In 2011 Australia released its first clinical guideline for perinatal mental health (Austin et al., 2011). An update of the guideline was launched in October 2017. The updated guideline continues to recommend that all women giving birth in Australia be screened for depression, and be asked about key aspects of their broader psychosocial health, as a routine component of maternity care. 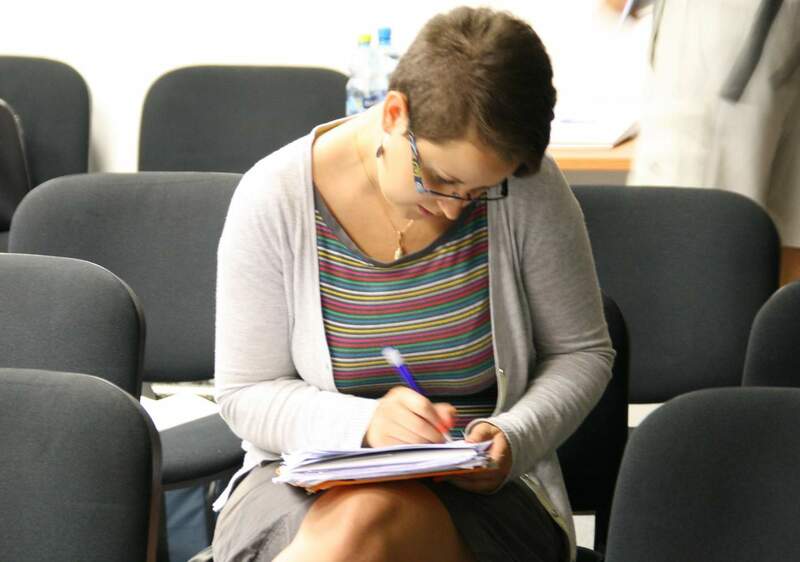 Psychosocial health screening looks at the contribution of social and emotional factors to health and might include questions around access to practical and emotional support, relationships, mental health history, use of drugs and alcohol, and experience of abuse and violence. Women from the 1973-78 cohort of the Australian Longitudinal Study on Women's Health (also known as Women’s Health Australia) have responded to questions relating to pregnancy and postnatal health since Survey 2 in 2000. The information they’ve shared has contributed greatly to our knowledge of the emotional health challenges facing pregnant and postpartum women. Using information provided by women in this cohort, researchers have been able to clearly identify risk factors for postnatal depression. These include mental health history, recent stressful life events and the lack of available social support (Chojenta et al., 2012). The research also revealed that women’s emotional wellbeing during pregnancy is impacted by past pregnancy loss (either through miscarriage, still birth, ectopic pregnancy, or medical termination). Women who experienced a pregnancy loss were more likely to have depression, anxiety, low mood, and stress during subsequent pregnancies. However, the impact didn’t continue into the postpartum period (Chojenta et al., 2014). In 2011, over 1800 women from the 1973-1978 Cohort participated in a substudy survey that focused specifically on the mental health and emotional wellbeing of women throughout the perinatal period. The information gleaned from this unique substudy has been critical in increasing our understanding of the emotional health issues that can be faced by women who give birth in Australia, and on how well national programs – such as the National Perinatal Depression Initiative – have been able to achieve their goals. The substudy clearly showed that women who were screened for depression were more likely to be referred to mental health and other support services during pregnancy (19.0% vs. 3.7%) and in the first year postpartum (20.7% vs. 4.0%) than those who weren’t screened (Reilly et al., 2013). Importantly, when women experiencing significant emotional distress were asked about their emotional health by a midwife, GP, or obstetrician they were also far more likely to seek help for these issues than those who weren’t asked (Reilly et al., 2014). A key finding from the study was the disparity of care between patients in the public and private systems. 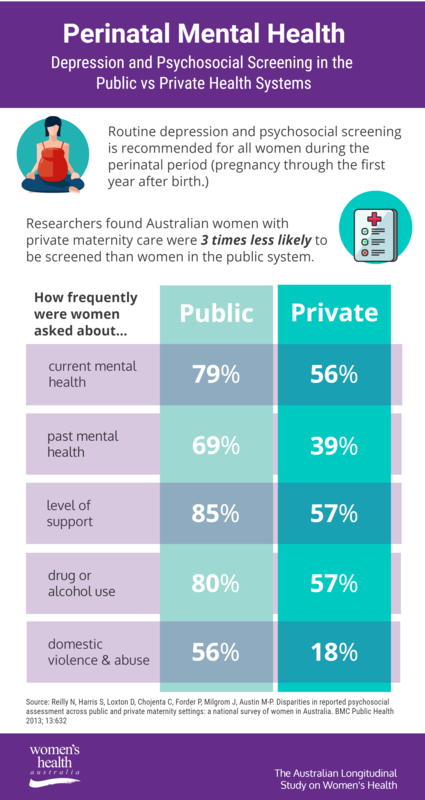 While routine depression screening and psychosocial assessment have been widely implemented in Australia, women choosing private maternity care are up to three times less likely to be screened than women delivering in the public sector (Reilly et al., 2013). Unfortunately this means they are more likely to go undetected and untreated. The significant body of work has been used as an evidence base for clinical practice change and innovative service development with industry partners. mummatters is an online, mobile accessible tool that aims to reduce the impact of perinatal depression and anxiety by directing parents to seek help. 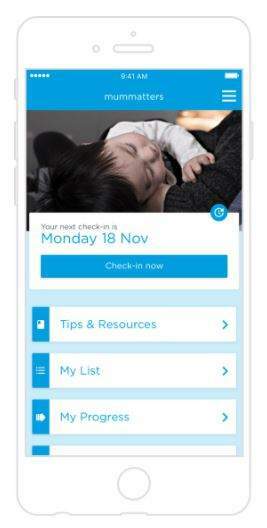 It was launched in November 2016 and is the first tool for perinatal depression screening and psychosocial assessment that is specific to the Australian healthcare system. The development of mummatters came about as a direct result of the Women’s Health Australia 2011 substudy on perinatal mental health. The results of the substudy (funded by the Bupa Health Foundation) revealed the inequality of access to depression screening between Australia’s public and private systems. This resonated with Bupa, a leading provider of private health care. Their commitment to closing the gap led to a collaboration with St John of God Health Care and the University of New South Wales. 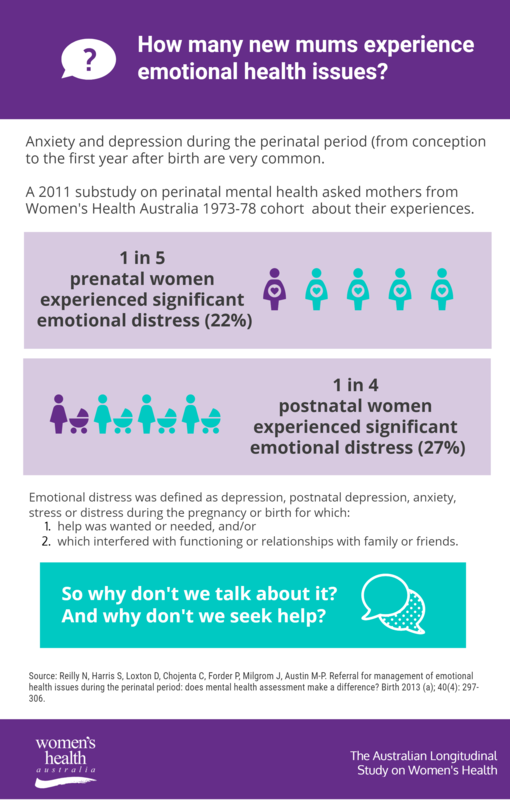 The mummatters development team included perinatal mental health expert Prof Marie-Paule Austin and researcher Dr Nicole Reilly (a former PhD student with Women’s Health Australia), and was led by the Bupa Health Solutions leadership team. The recently updated national perinatal mental health guideline provides healthcare workers with recommendations for evidence-based practices to incorporate into clinical care. The updated 2017 guideline cites research from Women’s Health Australia. The guideline was commissioned by the Commonwealth Government of Australia and developed by COPE (the Centre of Perinatal Excellence). 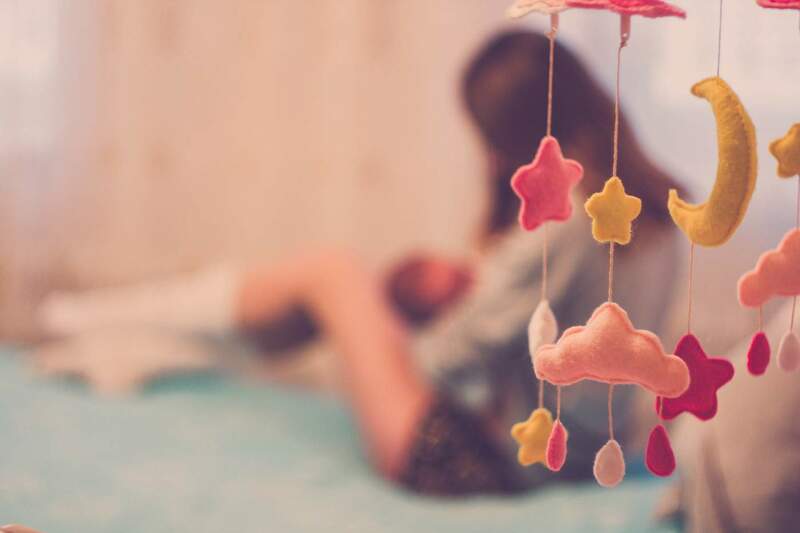 In an important shift towards prioritising perinatal mental health alongside physical health, the Australian Government recently announced pending changes to Australia’s Medicare Benefits Schedule (MBS) items for obstetric services. The proposed changes to MBS items 16950, 16951 and 16407 include a requirement that a mental health assessment, inclusive of screening for substance use and domestic violence, be undertaken as part of antenatal and postnatal care and management. Research from Women’s Health Australia contributed significantly to the evidence-base underpinning these items. AIHW: Humphrey MD, Bonello MR, Chughtai A, Macaldowie A, Harris K & Chambers GM 2015. Maternal deaths in Australia 2008–2012. Maternal deaths series no. 5. Cat. no. PER 70. Canberra: AIHW. Austin M-P, Highet N, the Guideline Expert Advisory Committee. The beyondblue Clinical Practice Guidelines for Depression and Related Disorders — Anxiety, Bipolar Disorder and Puerperal Psychosis — in the Perinatal Period. A Guideline for Primary Care Health Professionals Providing Care in the Perinatal Period. Melbourne: beyondblue; 2011. Austin M-P, Highet N, and the Expert Working Group. Effective Mental Health Care in the Perinatal Period: Australian Clinical Practice Guideline. Melbourne: COPE: Centre of Perinatal Excellence, 2017. Chojenta C, Loxton D, Lucke J. How Do Previous Mental Health, Social Support, and Stressful Life Events Contribute to Postnatal Depression in a Representative Sample of Australian Women? Journal of Midwifery & Womens Health 2012; 57(2): 145-50. Chojenta CL, Harris S, Reilly N, Forder P, Austin M-P, Loxton D. History of pregnancy loss increases the risk of mental health problems in subsequent pregnancies but not in the postpartum. PLoS One 2014; 9(4): e95038. DoH. Changes to MBS items for obstetric services. Effective from 1 November 2017 (subject to passge of legislation). Canberra: Department of Health, Commonwealth of Australia, 2017. PANDA. The cost of perinatal depression in Australia. Final Report Melbourne: Post and Antenatal Depression Association Inc (PANDA) & Deloitte Access Economics., 2012. Reilly N, Harris S, Loxton D, Chojenta C, Forder P, Milgrom J, Austin M-P. Referral for management of emotional health issues during the perinatal period: does mental health assessment make a difference? Birth 2013 (a); 40(4): 297-306. Reilly N, Harris S, Loxton D, Chojenta C, Forder P, Austin M-P. The impact of routine assessment of past or current mental health on help-seeking in the perinatal period. Women and Birth 2014; 27(4): e20-e7. The research on which this report is based was conducted as part of the Australian Longitudinal Study on Women's Health by the University of Queensland and the University of Newcastle. We are grateful to the Australian Government Department of Health for funding and to the women who provided the survey data.